While the built-in myCRED Gateway add-on allows your users to pay for the entire order using points, it is all or nothing. If the user lacks the necessary funds, they can not pay. Unfortunately WooCommerce does not allow you to make multiple payments on a single order. This means you need to choice one payment method which will either process the order or fail it. Enter Coupons. WooCommerce coupons can be used in a lot of different ways to discount your customers cart. It can give a set percentage in discount or a fixed amount, the later is what this plugin utalizes. Your customers can convert their points into a fixed amount coupon which is automatically applied to their cart. So there is no need for them to write down a coupon code or apply the code manually. Of course if they empty their cart and do not complete their purchase, the coupon they created is refunded to them. If allowed, they can also select to remove it themselves on the checkout or cart page. 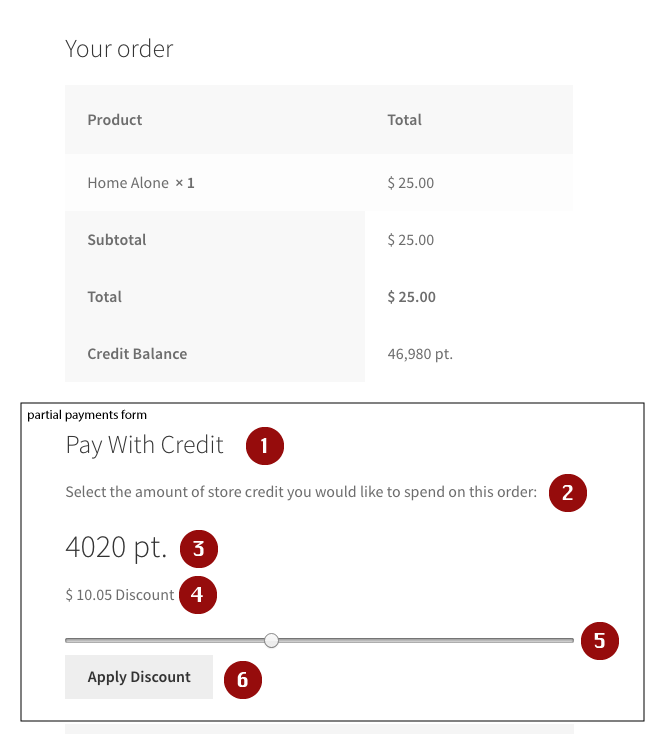 If you want to allow users to convert points into a WooCommerce coupon but can live without it being automatically applied to the cart, there is a custom shortcode I wrote that you could use instead. This solution would require your users to write down / save the coupon code they receive and apply it to their cart themselves. 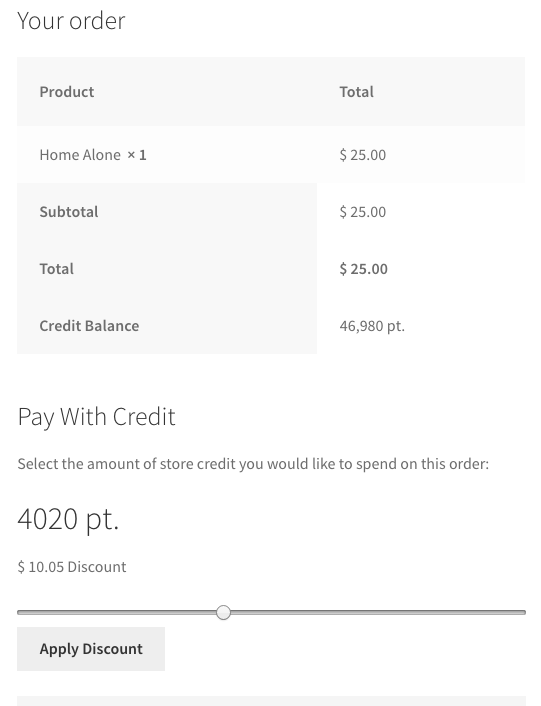 You can select to use a slider or an input field on the checkout page for partial payments. This plugin eliminates the need for the built-in gateway add-on for WooCommerce. While you can see the myCRED gateway in the admin area, it will be disabled and users will not be able to use the gateway. While this plugin offers partial payments, if the user can afford it and if you allow it, you can let users pay for their entire order using points, just like the built-in gateway. It is therefor recommended that you disable the Gateway add-on when using this plugin. This is the title of the form which can be changed in your settings. The default template uses an h3 element but this can be changed by using your own template via your theme. Optional description field. This can be changed in your settings and is empty by default. This represents the total point amount a user has selected to convert OR if you enforce a minimum, the minimum amount a user must convert. This is NOT the users balance! This is the amount the nominated point amount is worth based on our exchange rate. This is updated automatically as the user enters a point value or moves the slider. This is either a slider or an input field where the user select how much points they want to spend. This is the submit button. You can change the label used in your settings.